Arrested Development and Gabrielle were the clear crowd favourites of festival-goers, which is no surprise considering the mega-artist status both achieved in the 90’s. Garnering roaring applause from attendees at the grounds, the bands’ most popular songs such as ‘Dreams’ and ‘Everyday People’ became sing-alongs for the thousands of people at the event. Having been warmed up by Adam Baluch, South Africa’s most loved young band, Freshly Ground performed their smooth rhythms as the sky glowed red behind the UAE’s iconic national stadium, providing the perfect backdrop for the relaxed and social event. British soul queen, Gabrielle, proved that 23 years after making a mark on the music scene in the UK, she still has what it takes to command an audience. Singing with her stripped back band, her performance had a unique sense of intimacy that left the fans spellbound. With a set list including some new music and hits from the archives such as ‘Sunshine’, ‘Rise’ and ‘Out of Reach’, the performance hit a crescendo as she belted out ‘Dreams’ to send chills throughout the audience. Building on the energy of the previous headliners, music producers Snap! ended the evening with their mega dance hits. The duo injected new life into the crowd, who could not help but dance along to hit after hit performed. The band’s lead singer Penny Ford interacted with the cheering audience in between songs before playing ‘Rhythm is a Dancer’ to complete the night. The eager crowd demanded an encore, to which the Snap! happily conceded, performing ‘Rhythm is a Dancer’ again. 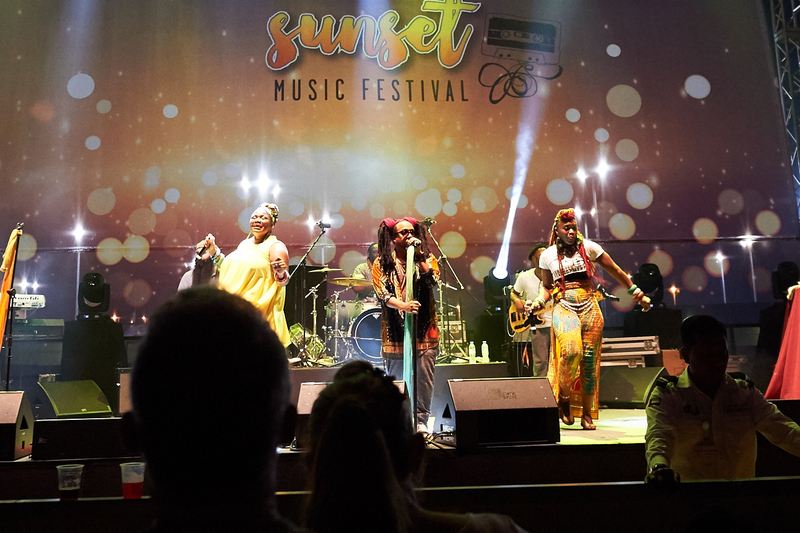 Sunset Music Festival marks the first time that Zayed Sports City has promoted its own entertainment event. Having achieved success in organising community events that included a feature stage, the festival was the next logical step, and the results exceeded expectations. We at The Capital List just LOVE new events coming to Abu Dhabi, we hope we see more of these type of events at Zayed Sports City in the future, fingers crossed folks.